Superman in "The End of Clark Kent's Secret Identity!" Penciled & inked by Al Plastino. 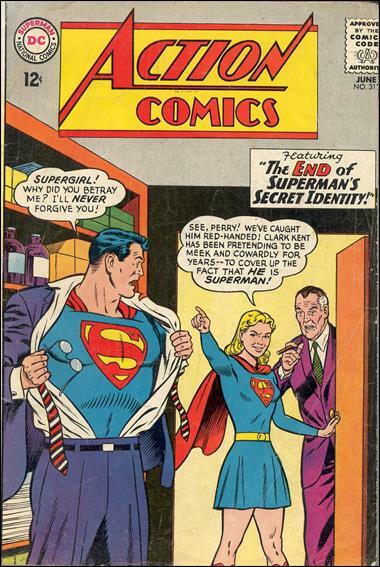 *Superman's best friends are turning on him, first Supergirl reveals his Clark Kent identity to Perry White. Later he finds his secret identity also being revealed to Lois Lane by Batman and to Jimmy Olsen by Lori Lemaris. As a last ditch effort to save his alter-ego, Superman convinces Perry, Lois and Jimmy to allow him to brain-wash them. *Cap offers a quick cure for a child with a chronic illness. Supergirl in "Lena Thorul, Jungle Princess!" *Lena Thorul gets a temporary job with the F.B.I., only to find that having the job has revealed to her that she is Lex Luthor's sister. *Shorty finds a way to walk in the open outdoors, without getting hurt. 1 page.